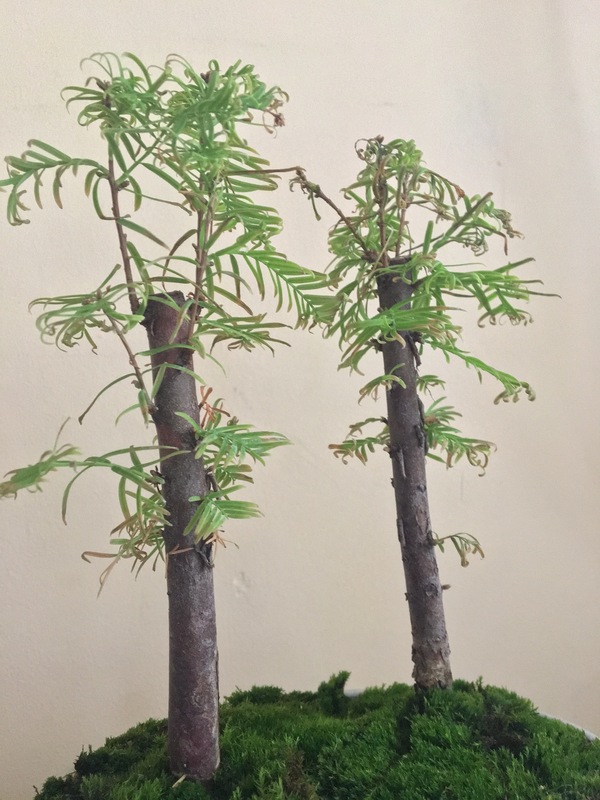 Redwood Bonsai Trees leaves issue? 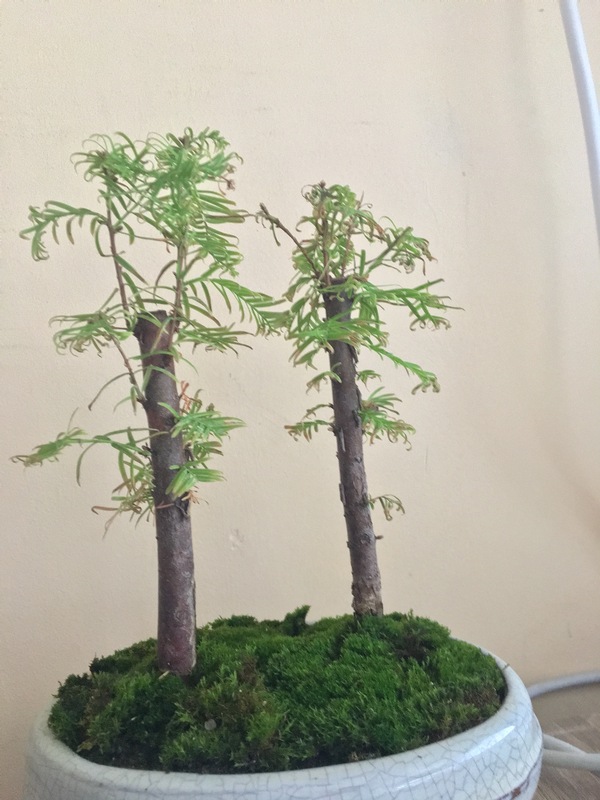 I had a tiny forest of 4 trees, but 2 were quite bad and they just died. Now, these 2 that left, i dont know if I should be worried or it's normal, but their leaves are starting to get all dry and fall out. I don't know if that's normal really. Yesterday I repotted them and pruned the roots to promote radial root system, I added moss on top too. I haven't touched the trees since I bought them. I disagree about the over watering. The experience I have had with Bonsai is that they need water pretty much every day. Little soil to hold water. I always dunked my Bonsai the pot and soil into a bucket of water. I waited until the air bubbles would stop then remove it. I have never ever seen a Bonsai that had too much water. Yours looks like it has been struggling with water as well as light. You do need to give it fertilizer. Those chemicals don't come with soil nor should they. Justs get good old basic Osmocote 14-14-14 extended release and use 1/4 of the amount they put in the directions. Do this now and again in 6 months. Water your Bonsai every other day by dunking the whole pot in a bucket to soak it...wait until the air bubbles stop floating to the surface. Go ahead and wash the entire plant once in a while while in the bucket of water. When your plant is out of doors under a porch roof, it will probably need water every single day. Put the Osmocote beneath the moss so it doesn't float off when dunking. Never put this Bonsai out of doors unless you are positive it won't get any direct sun. To do that you have to take a month to harden it off so it doesn't sun burn. A covered porch is fine. In doors it should be in a very bright window, again not in direct sunlight unless it is already used to direct sunlight even through a window. To water a Bonsai with a mound of moss is pretty tough unless you dunk. Can I ask what happened to the previous moss? If moss dies on a Bonsai that Bonsai is not getting enough water. Bonsai are completely different than other potted plants. Completely artificial needing our help with every thing. There is a normal dormancy period with these little trees but not if they've been indoors with temperature control. They have had no signals they need to go dormant. They can be out of doors during the summer when there is no chance of frost but because they are potted their roots are subject to the cold temperatures and cold will kill plant roots in pots. A covered porch for the summer will give lots of ambient sunlight. A heck of a lot more than the light in the kitchen window. If you are careful, you could harden your plant to be able to be in full sun for the summer. Then when you take it back inside for the fall and winter you have to do a reverse acclimation. This is time consuming but it is the difference between a healthy plant and a dead one. Your plant looks under watered and definitely in need of a bit of fertilizer. Chemicals it needs to do the job of photosynthesis where the plant makes its own food. Just a bit of balanced fertilizer and more water and hopefully it is getting as much light as possible by being put as close as possible to a big south window...without being in direct sunlight unless it is used to direct sunlight through windows. If you want to put this guy out of doors for the summer there is a process of acclimation you MUST do before putting an indoor plant, even one used to lots of direct sun through a window, out in the real sun light. Takes at least 2 weeks up to a month for acclimation. To take it back indoors takes just as much time. The link I sent doesn't get into the acclimation but trust me, it is critical if you want to keep your Bonsai alive. A redwood requires more than high humidity, they need to be bathed in fog to remain healthy. Research shows that coastal redwoods get most of their water from fog, through their leaves and not from their roots - as most other vascular plants. In 2012, Professor Ishii's research group climbed the world's tallest redwoods, and collected leaf samples from various heights. They discovered that, with increasing height in the tree, the proportion of "xylem tissue" which transports water from the roots decreased, whereas "transfusion tissue," which stores water, increased. They inferred that in redwood, the stored water came from moisture absorbed through the leaf surface, such as fog and dew. The floor of a redwood forest hosts a variety of highly specialized plants which rely on precipitation caused by the redwood canopy condensing and dripping fog-water. Your bonsai may respond by regularly misting the tops like the morning fog in along the northern California coast. You're keeping it indoors. Microscopic pests are attacking the leaves. Water all you want, mist all you want, the leaves will still drop. That thing needs to be outside. Not the answer you're looking for? Browse other questions tagged trees leaves bonsai redwood or ask your own question. What are some fast growing bonsai fruit trees in Delhi? What are the different styles of bonsai trees? Should I be worried about cold snaps affecting my sugar maple seedlings? Which two leaders of my Dawn Redwood should I remove?